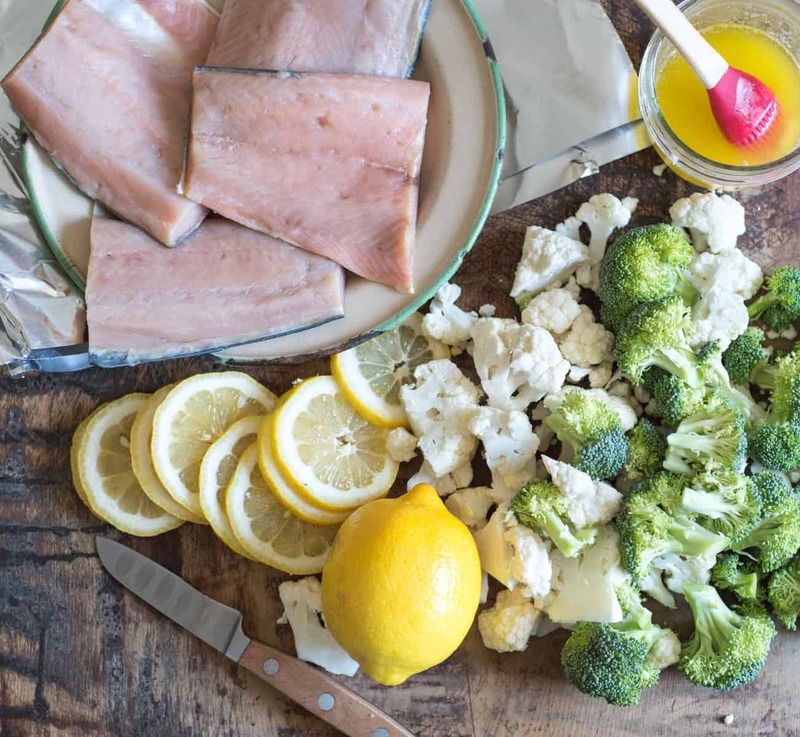 Quick and easy Garlic Butter Baked Salmon in Foil with broccoli and cauliflower makes an easy dinner recipe that is done in about 20 minutes. Long live super simple dinner recipes that are easy to make, delicious, healthy, and a breeze to clean up! 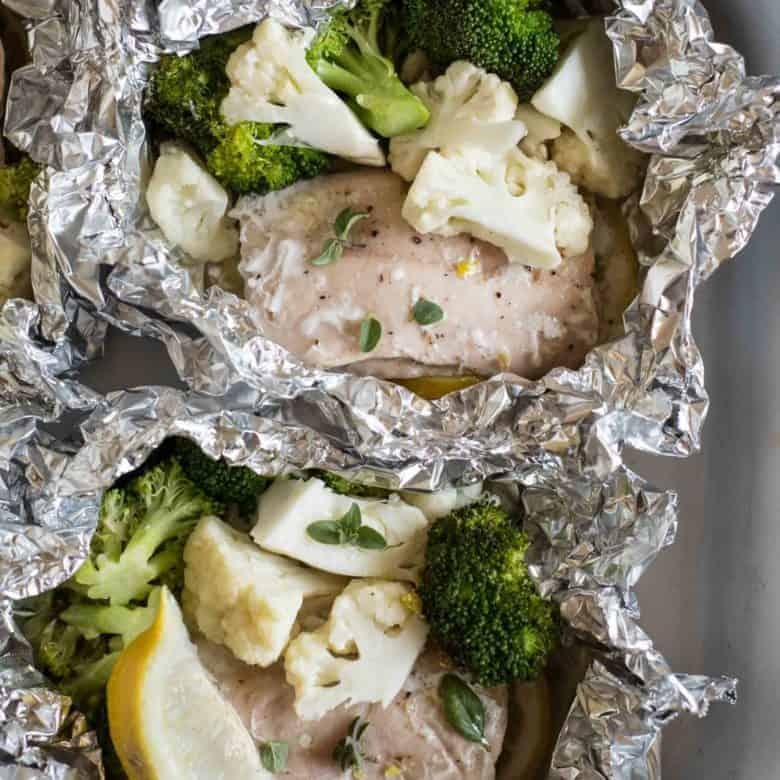 If any of those factors sounds like a good dinner in your book than you are going to love this recipe for garlic butter baked salmon in foil. There’s something magical about making a “packet dinner,” and salmon baking in a foil packet is no exception. The fish comes out moist and tender, the vegetables are steamed inside until they are tender crisp, and the simple garlic butter on top melts right into everything, making one delicious meal in a matter of minutes. My kids eat and love seafood as often as they can get it. We don’t buy it often but when we do have it, it’s a treat we all enjoy. I often grill up fish fillets in the summer and these salmon foil packets are just as easy. Bonus – you can bake or grill them, making it really convenient any time of the year. The fresh lemon is a must – don’t skip it! You need 2 lemons: one to slice and bake with the fish and a second to cut into wedges for serving. Quick dinner tip: if your fish fillets are frozen individually, you can easily thaw them in a bowl of warm water in about 30 minutes. This is really great served with some seasonal fruit and a load of my favorite no knead crusty bread or Santa Fe Rice. Both are great options. Tear off 8 sheets of foil about 12 -14 inches long. Double up the foil by stacking two pieces on top of each other so you are working with 4 sets of foil – 2 pieces each. Brush a bit of the butter mixture in the center of each set of foil and place two slices of lemon on top of the butter. 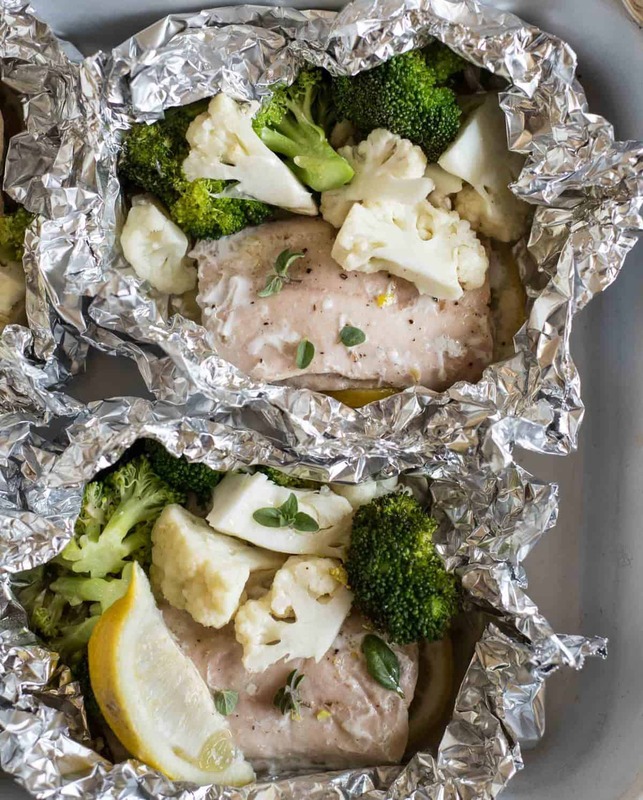 Evenly distribute the salmon fillets, broccoli, and cauliflower between each of the foil packets. Brush the additional butter over the vegetables and fish. Add salt and pepper to taste. 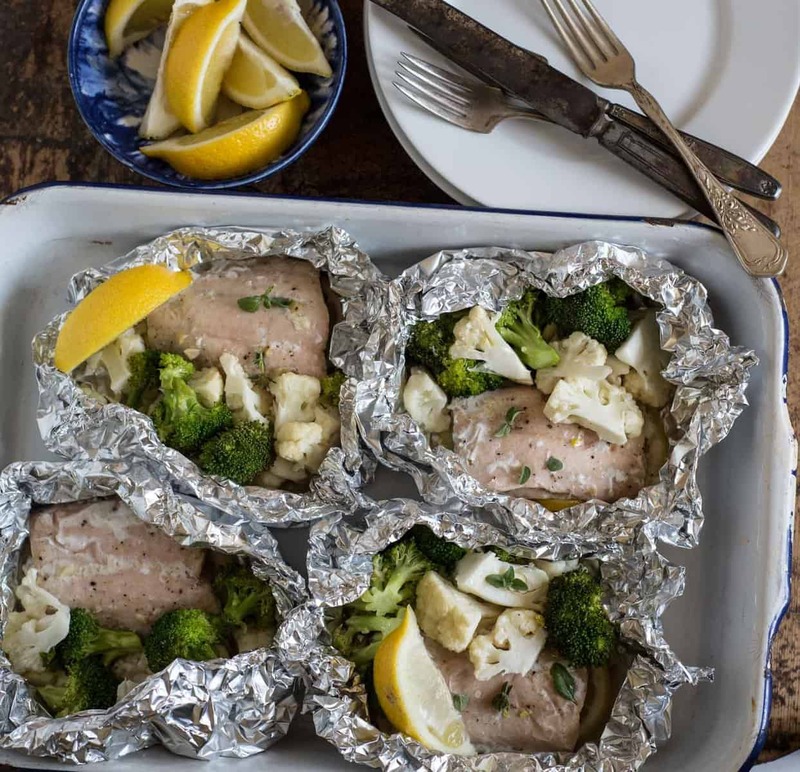 Place foil packets on a baking sheet and bake in a 400 degree oven for 10-12 minutes until the fish is cooked through. Remove from the oven when fish is cooked through. Carefully open the foil packets and enjoy while still hot. Serve with additional lemon slices. You can also grill these salmon packets over medium to medium-high heat for 12 to 15 minutes until the fish is cooked through – a great option to keep the oven off in the summer. Fresh, easy, and fast – just what all busy moms need in their life! Needing a little more quick dinner inspiration? One Pot Baked Ziti and Chicken Street Tacos are always on my go-to list! Love how quick and simple this is! And it sounds amazing. 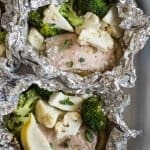 Foil packets are the best solution for weeknight meals! Love, love, love them! This is such a satisfying and easy weekday dinner! Love simple meals like this! Cover completely, you’ll make a sealed packet out of the foil!